When baking cupcakes for a party, typically you make enough plus a few extra for the expected number of guests. But occasionally you may have leftovers—and if you want to save your creations to enjoy later you will need a way to store them. The options for keeping them fresh vary depending on how long you need to store them. Unfrosted cupcakes will stay fresh for two days without refrigeration. However, if you plan to cover the cupcakes with frosting that requires refrigeration, you should wait to frost them until you are ready to serve them—within two days. 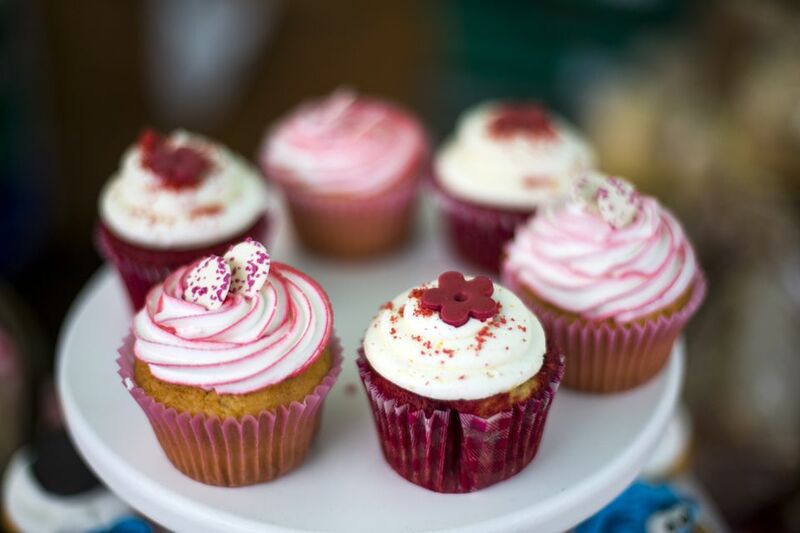 Allow freshly baked cupcakes to cool completely on a wire rack for at least an hour. The wire rack allows the bottom to cool as well as the sides and tops. If they are still warm, they will continue to release steam which can make the cupcake tops sticky when you go to frost them. Place them in a plastic storage bag or airtight container and simply keep them at room temperature. They will maintain their freshness as long as they don't lose moisture or are subjected to swings in temperature. If you've stored cupcakes at room temperature and discover the tops are sticky, making them difficult to frost, allow them to sit uncovered for an hour to dry out a bit. Piping the frosting rather than spreading it with an offset spatula or knife will also help keep the tops intact. Resist the urge to store cupcakes in the refrigerator to extend their shelf life beyond two days. Cupcakes stored in a refrigerator will dry out. In fact, placing cupcakes in the refrigerator speeds crystallization in the sugar and flour, making the cupcakes go stale quickly. The only time you may want to consider placing cupcakes in the refrigerator is if the frosting is melting rapidly, perhaps during the summer or in warmer climates. Another exception is if your cupcakes have a filling or frosting made with dairy, eggs, or custard. Then they must be refrigerated for food safety. Although the refrigerator will dry out cupcakes, the freezer is very effective for cupcake storage. Stack unfrosted cupcakes in a 16-ounce freezer bag—you should be able to fit about a dozen in a bag of this size—and place cupcakes in the freezer where they will not get crushed or smashed by heavier items. If the cupcakes are heavily frosted, then you may want to place the cupcakes individually in small plastic freezer bags. When you are ready to eat the cupcakes, take them out of the freezer and remove the liners to let them defrost on a plate or cupcake stand. If you don't remove the liners, they can become gooey and the top can pull away once defrosted. Do not use a microwave or an oven to defrost them. Frozen cupcakes will thaw in about two hours sitting at room temperature. An alternative use for frozen cupcakes is to deep fry them. Coat the frozen cupcakes in prepared pancake batter and submerge them in a deep fryer with oil at 375 F. (You can use a deep skillet but be careful as splatters can cause a fire hazard.) Sprinkle the fried cupcakes with powdered sugar and/or cocoa powder and place them directly on a baking rack to cool. Enjoy the delicacy!